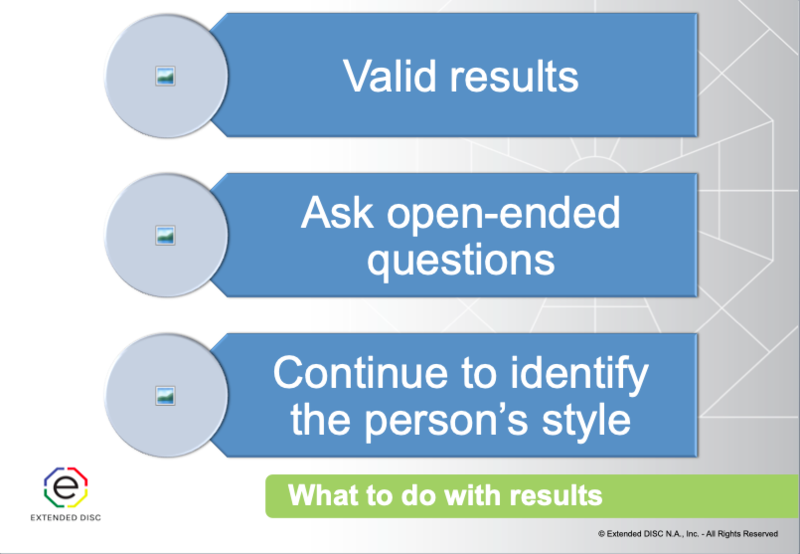 You can identify key emotions to help provide deeper insight into a person’s Extended DISC® Profile results. DISC workshops are usually not the best place to dive deeper into individual results or discuss key emotions. 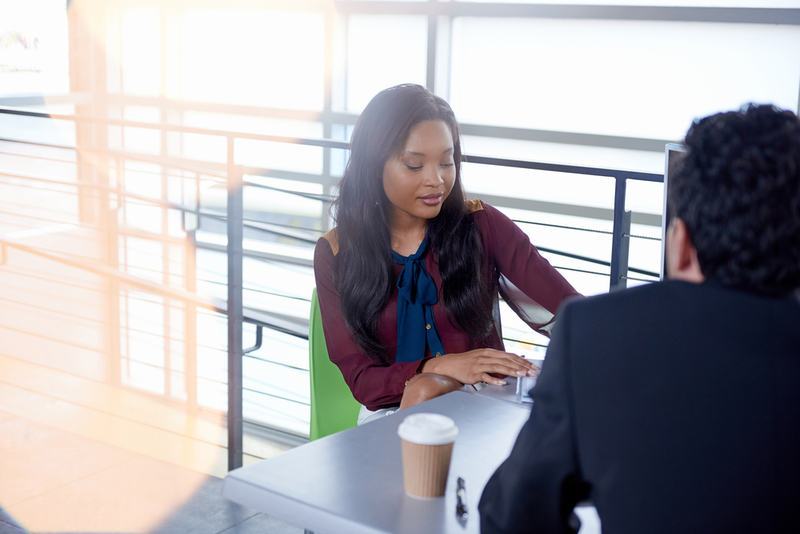 However, if you are coaching or mentoring someone one-on-one, it can provide additional information on what the person may be feeling. In doing so, it can help identify what may be an obstacle to the person’s success. There is nothing in the person’s report that will talk about the person’s key emotions. The ultimate goal is not to memorize, but to recognize when these special situations profiles may occur. 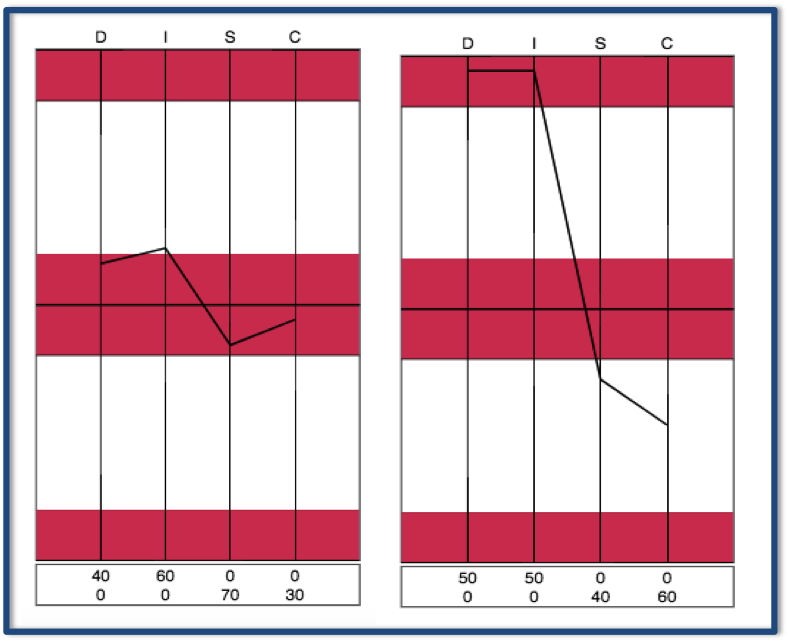 Here are some examples of Extended DISC® Profiles that may exhibit key emotions. The example above represent a person’s Profile I (Perceived Need to Adjust) and Profile II (Natural Style). 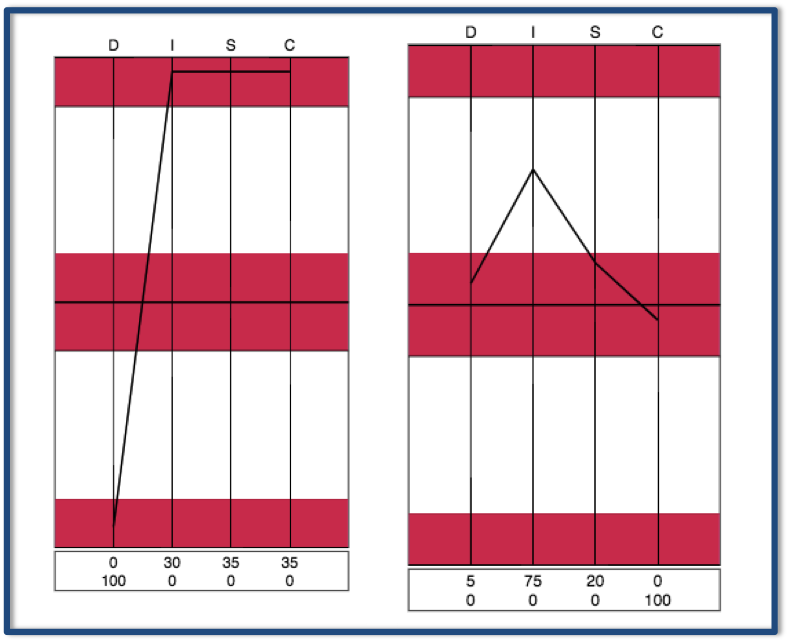 D-style and I-style are above the Middle Line in both profiles; however, the size and the shape of the two profiles are clearly different. All four styles on Profile I (above image on left) are plotted close to the Middle Line or essentially plotted in the shaded Neutral Zone. 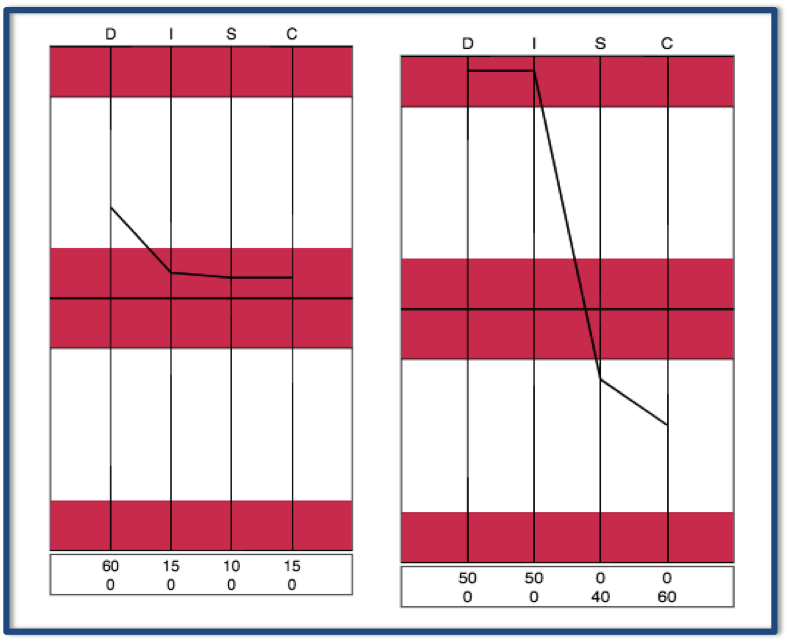 Profile II (above image on right) has a wide size and shape with a clear gap between the D and I styles above the Middle Line (natural styles) over the S and C styles below the Middle Line (not natural styles). The key feeling associated with a tight Profile I is uncertainty. They may not have been able to form a clear understanding of their role in their present work environment. This could be caused by unclear job responsibilities, being new to a position or role, or they’re seeking change to their existing situation. The person may not be certain how to modify their behavior. We are more likely to expect this result if the person is new to their job. If someone is not new, then it could mean something else is going on, and we need to explore deeper. If several team members show similar tight Profile I results then it would be beneficial to look at the team’s leader and how clearly they are defining team goals. If Profile II – Natural Style (above image on right) is tight, the person may be feeling a sense of pressure. Our first assumption is they could just be having a bad day where they were unable to focus. However, the person could also be feeling their future is not secure or perceive a threat that pertains to something they perceive as valuable. The feeling may be tied to the person’s personal life or intertwined between work and personal (e.g., financial issues). For example, they may be feeling a threat of losing their job, hear rumors about organizational changes, or be experiencing personal problems. The Profile II – Natural Style (above image on right) identifies D and I styles above the Middle Line. The graph line has the nice wide shape that does not suggest any underlying emotions. On the other hand, the Profile I (above image on left) has all 4 styles plotted above the Middle Line. This type of Profile I is identified as an overshift profile and the key emotion tied to it is ‘helplessness.’ This type of Profile I could indicate the person feels constrained or feels they are acting at the limits of their abilities. They may be feeling forced to go completely against their natural behavioral style in order to succeed in the demands of their present environment. This person may feel the need to be everything to everyone or overwhelmed in their present setting. They may be feeling helpless because they are identifying the need to be all styles; a situation that no amount of energy can sustain. 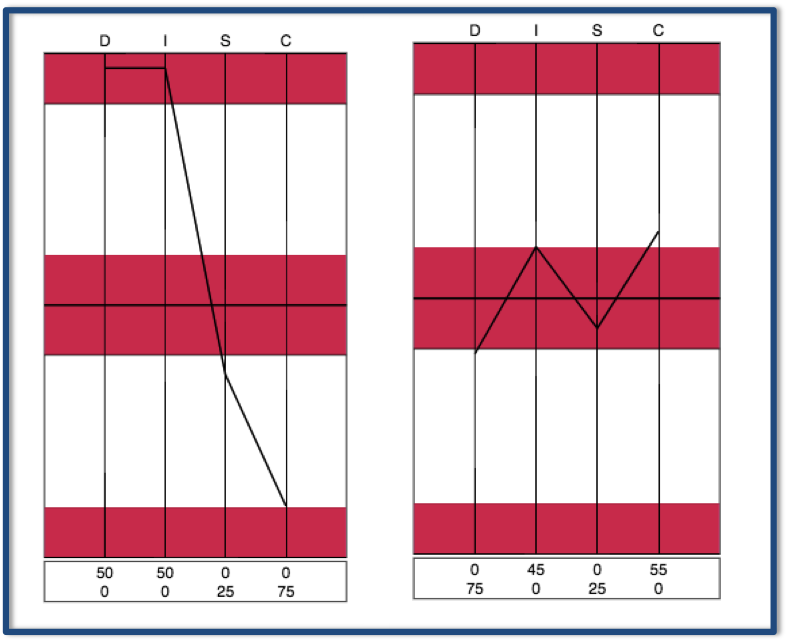 An ascending Profile II likely identifies the person’s underlying feeling as pressure.The person is more likely to feel a fundamental challenge they need to overcome. They may feel the pressures of the environment are too much to handle. The consequences of failure are more fundamental and internalized versus an ascending Profile I. For example, a person with an ascending Profile II could be feeling overwhelmed or burnt out.